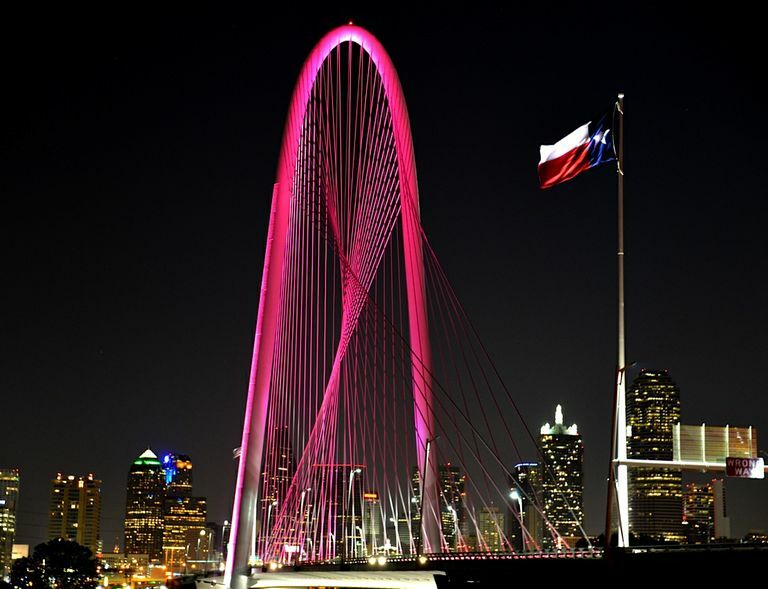 The Margaret Hunt Hill Bridge in Dallas glows pink in honor of Mary Kay Inc.’s 50th anniversary celebration. The bridge will be illuminated in the special pink hue from July 21 – Aug. 7 in honor of Mary Kay’s annual convention, known as Seminar, which brings 50,000 attendees to the Kay Bailey Hutchison Convention Center and delivers an economic impact of more than $49 million to the city of Dallas. Photo courtesy of Mary Kay Inc.
DALLAS (JULY 23, 2013) – Who says a 50th anniversary has to be a golden celebration? To honor Mary Kay Inc.’s 50th anniversary, and the arrival of nearly 50,000 independent sales force members for the company’s annual convention, landmarks throughout Dallas are twinkling with pink lights. 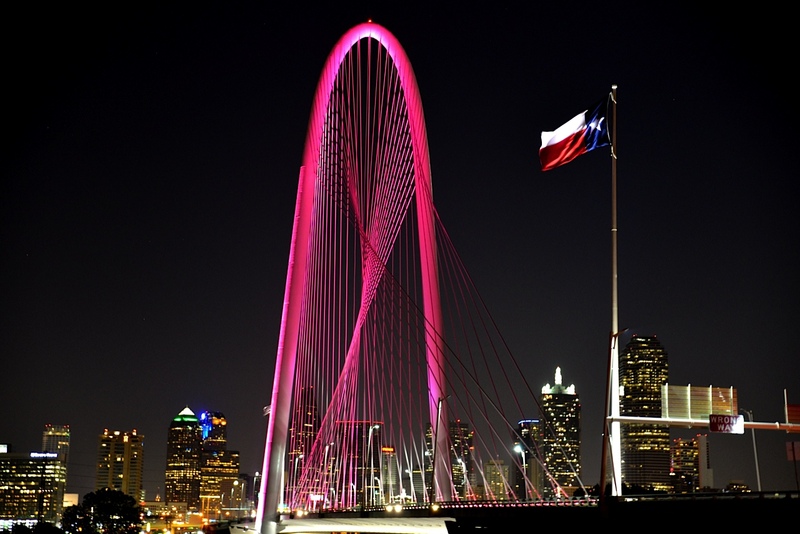 The city’s pink glow pays tribute to Mary Kay Ash, the visionary founder of Mary Kay and the inspiration behind the company’s 50th anniversary celebration entitled, “One Woman Can™.” From a small Dallas storefront in 1963 to a cosmetic powerhouse with 3 million independent sales force members worldwide, Mary Kay’s mission remains the same 50 years later – to enrich women’s lives. Mary Kay is hosting its annual convention, known as Seminar, in Dallas from July 21 through Aug. 7 where the success of the company’s independent sales force is celebrated. Seminar is focused on recognizing Mary Kay Independent Beauty Consultants for their achievements while also providing education, inspiration and motivation for the year ahead. This year’s Seminar theme, in honor of the company’s 50th anniversary, “One Woman Can™,” pays tribute to the enormous impact Mary Kay has had on the lives of women around the world. Mary Kay’s first Seminar in 1964 was held in the company’s warehouse where 200 attendees dined on chicken cooked by Mary Kay Ash herself. This year, nearly 50,000 people will attend the event at the Kay Bailey Hutchison Convention Center in Dallas generating an economic impact of $49.4 million for the city according to the Dallas Convention and Visitors Bureau.